The Jerusalem artichoke also called sunroot or sunchoke It is a species of sunflower which is a member of the daisy family and is native to eastern North America. It is also cultivated widely across the temperate zone for its tuber, which is used as a root vegetable. 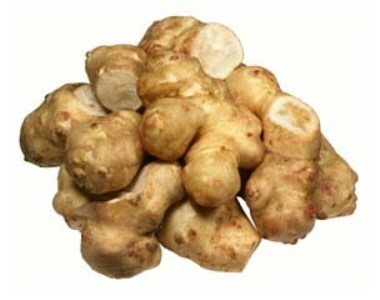 Despite its name, the Jerusalem artichoke has no relation to Jerusalem, and it is not a type of artichoke. The origin of the name is uncertain. Italian settlers in the USA called the plant girasole, the Italian word for sunflower, because of its resemblance to the garden sunflower. In Baden-Württemberg, Germany, over 90% of the Jerusalem artichoke crop is used to produce a spirit called “Topinambur (de)”, “Topi” or “Rossler”. Trim any big bumps to make them easier to peel. Once peeled, they discolour quickly, so place in a bowl of water and lemon juice to prevent browning. Jerusalem artichokes can be cooked in much the same way as potatoes or parsnips and are excellent roasted, sautéed or dipped in batter and fried, or puréed to make a delicious soup. Jerusalem Artichokes are grown in Queensland, NSW, Vic & South Australia. Jerusalem Artichoke are available ALL YEAR round. April - Sept : From NSW & S.A.
Jerusalem Artichoke gnocchi with sautéed kale. Set the Jerusalem artichoke pieces into a large pot and fill with cold water. Set over high heat; bring mixture to a boil, and continue cooking for 20 – 25 minutes, or until the Jerusalem artichokes are easily mashed with a fork. Set the ricedJerusalem artichokes on a lightly floured work surface, make a well, add the egg. Then, sprinkle on the flour, 1 cup at a time, adding up to 3 cups. Use a pastry scraper to fold the flour into the mixture. Mixture will be fairly sticky. With a light touch, continue adding the remaining cup of flour, or just enough so that the dough stops sticking to your fingers. Once the dough is holding together, knead it lightly for a minute or so. Form into an oblong mound, and then use the pastry scraper or a knife to divide into 8 sections. On a well-floured work surface, gently roll each section into a long, 3/4 inch thick tube. Use a sharp knife to cut off 1/2 inch sections, make a tiny indentation in the center with your fingertip, and then set on a lightly floured tray. Continue until all the gnocchi have been made. Bring a large stock pot with plenty of water to a boil. Add enough sea salt that a drop of the water tastes like the sea. Gently lower several gnocchi at a time into the rapidly boiling water. As soon as the gnocchi float up to the top, remove from water with a slotted spoon and set aside. Drizzle cooked gnocchi with a bit of olive oil. Meanwhile, heat a large skillet over medium-high heat. Add 2 tablespoons olive oil. When hot and shimmery, add the red pepper flakes, 1/4 teaspoon of sea salt, and black pepper. Add the shallots, and sauté until translucent. Next add the garlic and sauté a minute more. Add the kale, a bit at a time, along with a pinch of sea salt for each batch. Turn until kale has cooked down. Sprinkle in the vinegar and lemon zest. Turn heat to low, and cook for another 5 minutes or so. Spoon over a handful of gnocchi and finish with the shaved Asiago and a drizzle of olive oil. Bitter melon, bitter gourd or bitter squash in English, has many other local names. 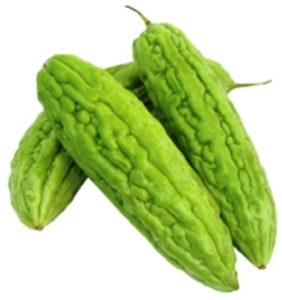 It is a tropical and subtropical vegetable from a vine that is widely grown in Asia, Africa, and the Caribbean. The vegetable is extremely bitter. Its many varieties differ substantially in the shape and bitterness of the fruit. Bitter melon is often used in Chinese cooking for its bitter flavor, typically in stir-fries, soups, and herbal teas. It is very popular throughout South Asia. In Vietnam, raw bitter melon slices consumed with dried meat floss and bitter melon soup with shrimp are popular dishes. 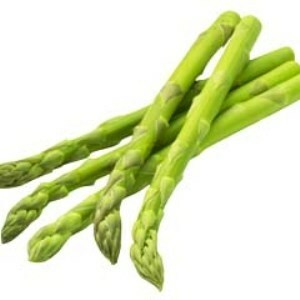 Asparagus is a perennial vegetable arising from a root system of fleshy rhizomes known as the crown with long feeder roots that can grow to a depth of 1.5-2 metres. In spring the crown sends up spears (shoots), which are the edible portion of the plant. Most green asparagus is ready-to-go. However, if the base of the stalk is tough, simply run a knife along the stalk until it meets less resistance, then cut the end off at this point. Or simply snap off the coarse ends with your forefinger and thumb. White asparagus spears are usually thicker than green asparagus. White asparagus also has a thicker outer layer that can be easily removed. Simply use a vegetable peeler to remove the outer layer of each spear two-thirds the length of the spear towards the tip, then snap off the woody end. Purple asparagus spears are between 10% and 15% wider at the base than green asparagus spears. To select the freshest spears, consumers should look for firm, crisp stalks and compact brightly coloured heads with no trace of softness.Prolonged cooking causes purple asparagus to turn a deep green colour. To retain the vibrant purple colour, it is best to cook purple asparagus just until tender crisp.